If you have Subscription for a subset of your users, you can automate even the rest of your userbase that runs on Credits (specifically new or moved users). The Subscription already comes with G Suite Data Sync which is a necessary prerequisite for the Automation. Start in Settings and enable Group based Automation. 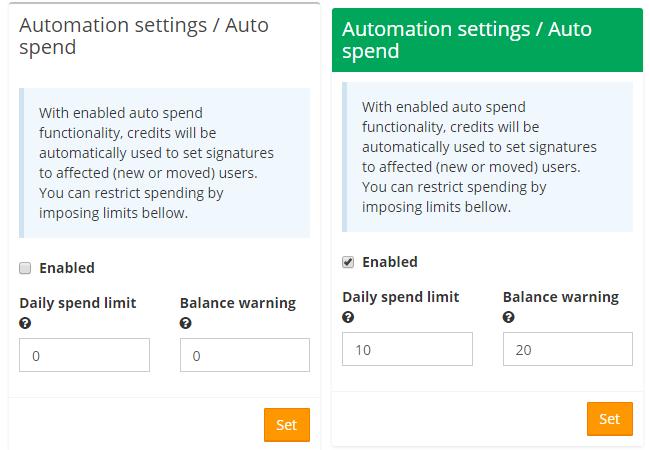 Now follow to Credit Automation settings, enable it and set a maximum limit for a daily expenditure and a warning threshold (you'll be notified by an email once it's reached). If you don't set the values or rewrite them back to 0, there will be no daily limit imposed. If the number of signatures to be set up would be greater than the limit, none will be set and you'll be notified via email and in the app. The next step is to pick the User Groups whose members (moved to them or new users imported from G Suite) will have their signatures set. Pick the CREDIT option in the Automation details for the specific groups - don't forget that unless you state otherwise, the subgroups will inherit the settings from parent group. And that's it, you have now automatized signatures for certain User Groups for Credits!